SSR LLC – The CAT is on a Hotter Tin Roof! The CAT is on a Hotter Tin Roof! There is an inconsistency developing between the expectations for Industrial companies compared to Materials. A good example of this at the stock level is CAT, where valuations are suggesting a much stronger recovery in mining than FCX is itself. If CAT’s valuation expectations are correct, we see more opportunities in their customers such as FCX, as well as VALE, BHP and Rio, that have not factored in the higher metal prices needed to fuel CAT’s earnings and that would support current valuations. Elsewhere in the mining capital equipment space, Volvo in particular looks more interesting than CAT as does Komatsu from a valuation perspective. CAT’s high-end target price is $158 per share; the consensus forward EBITDA multiple is now above 12x. Only Atlas Copco has a higher forward multiple. 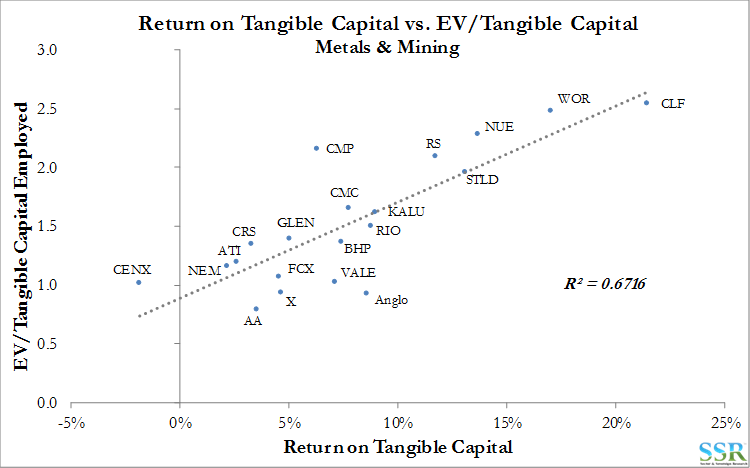 The uncertainty/leverage for CAT comes from mining. While other business segments are improving and justify some of the earnings revisions, mining is the largest lever. 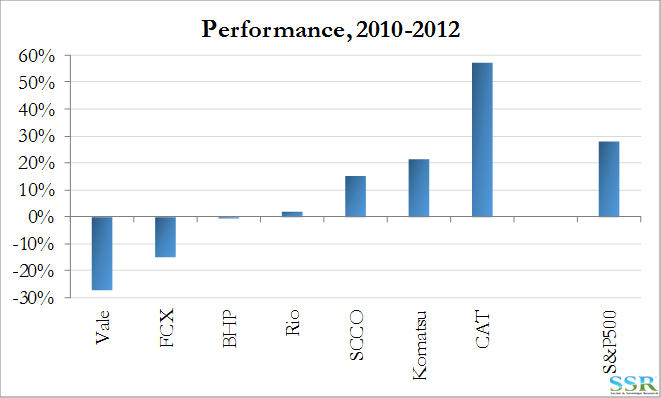 CAT is cheap only if construction/mining recovers, driving equipment spending as in 2010/11. 30% upward revisions since July may still underestimate CAT’s 2018 earnings. Cash flow estimates for mining companies anticipate slight declines in 2018 and 2019 – current pricing trends, economic forecasts and CAT’s valuation suggest upside. Since 2011 costs are lower and while, in theory, leverage could be higher, we suspect that CAT will hit pricing limitations outside the US from international competition. But for CAT to work, mining investment needs to accelerate – and this is likely the better investment – 2018 and 2019 mining estimates are too low. Accelerating economic growth supports a better mining environment, but metal exposure offers more upside in our view (FCX, AA, maybe Steel – NUE over X) than CAT. 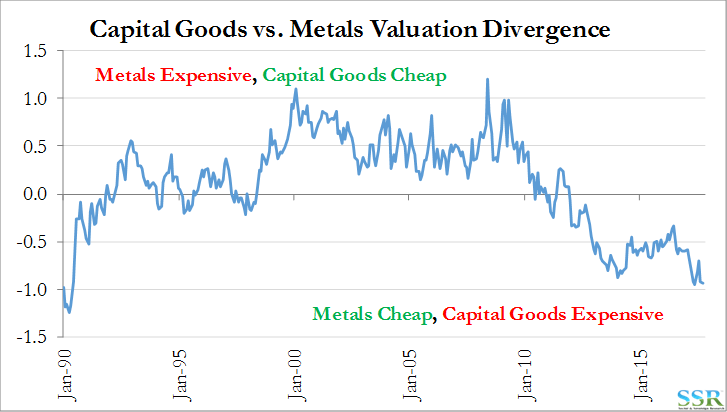 On a sector level Metals and Mining are at a valuation extreme versus Capital Goods – Exhibit 1. 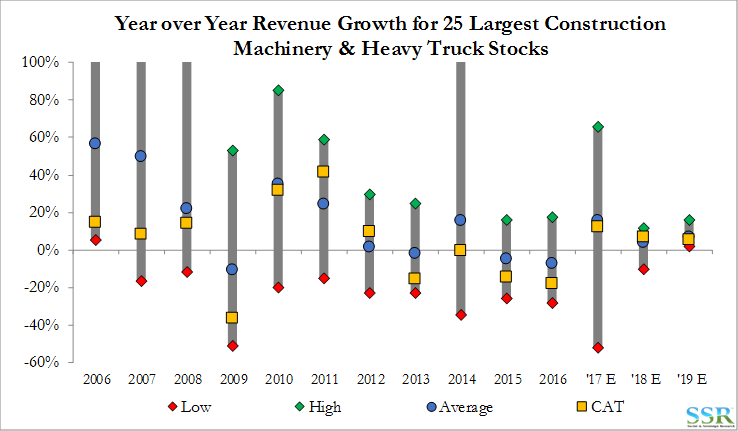 As shown in Exhibit 2, the revenue growth expected for the heavy equipment companies for 2017 to 2019 shows meaningful growth versus the previous 5 years, but remains well below the average of the prior 10 years. It also shows much less confidence in 2018 versus 2017, which we suspect is too conservative given some of the economic levers that we have been discussing in recent research. We may see some of these estimates pick up after third quarter earnings reports as we rarely see estimates move materially between earnings reports. Companies themselves are probably being cautious in their guidance, given recent history. The group used in this analysis is eclectic geographically, but comprises the list of largest market cap companies grouped in this category by Capital IQ – Exhibit 3. The extremes in Exhibit 4 tend to be the newer companies in the developing markets – CAT is generally close to the middle of the pack. CAT’s mining exposure is clear in the 2013 to 2016 period, and estimates for 2018 and 2019 are consistent with a more muted view of a mining recovery. Note that the range of estimates for CAT is very wide and span the ranges shown for the group in 2018 and 2019. In Exhibits 5 and 6 we show the same analysis for EBITDA. 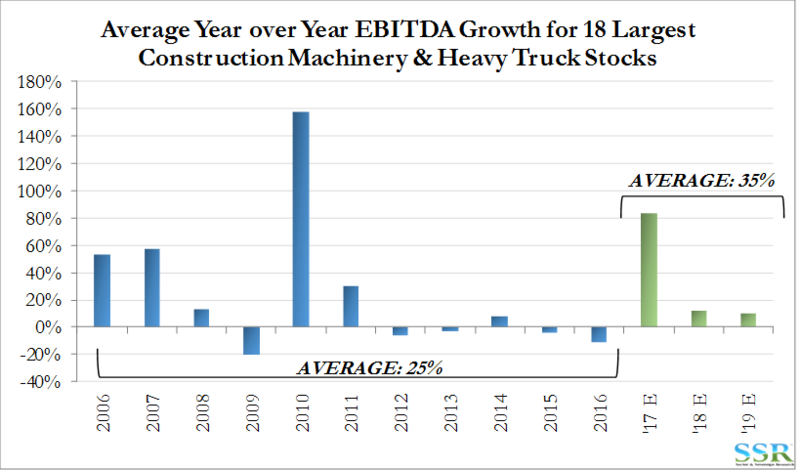 The difference between EBITDA growth expectations and revenue growth is a function of the expected operating leverage and while that is appropriately reflected in 2017 (as we have half of the year and more explicit guidance) EBITDA growth estimates for 2018 and 2019 look low given where revenue growth sits and the operating leverage. 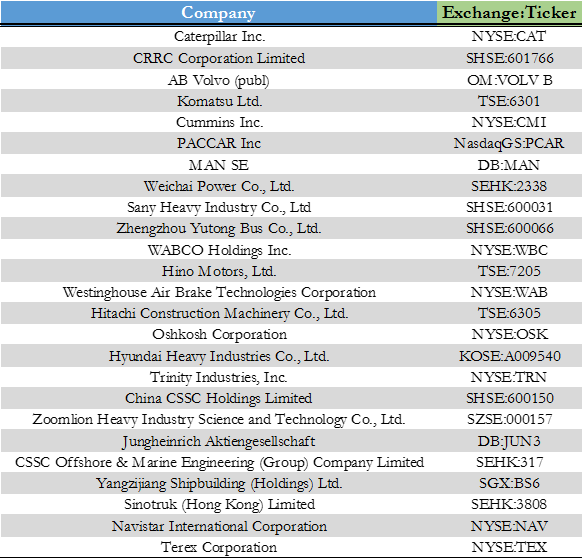 CAT’s operating leverage superiority to others is illustrated in the above-average moves to the upside and the downside in Exhibit 6, with 2017 off because of some extreme moves at Chinese companies Zoomlion, Sany Heavy Industry, and Sinotruck. 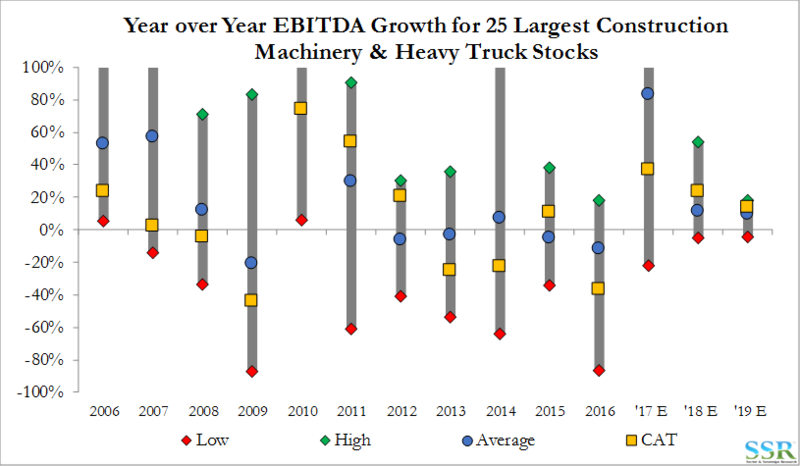 Among the US Capital Goods companies, CAT has the widest range of views today with a one standard deviation swing high to low representing 32% with respect to target prices (Exhibit 7). Clearly there are very different expectations for the fate of the mining industry in 2018/2019 and/or for CAT itself. 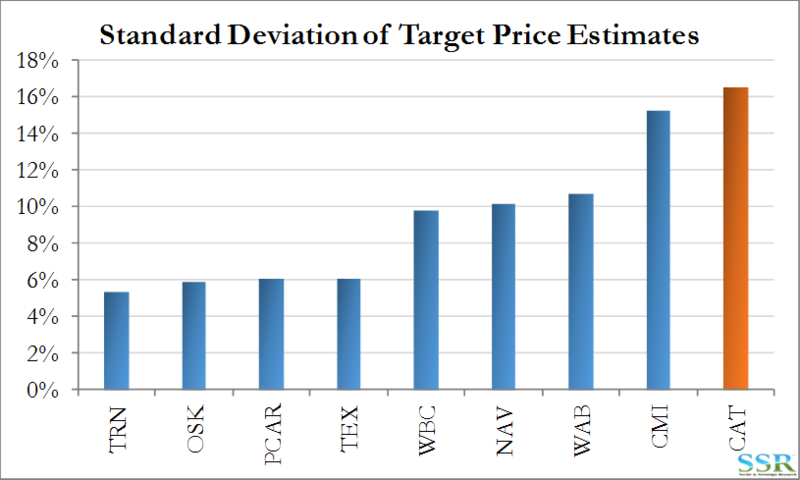 At the high end of the target price range ($158 per share), there is an expectation that not only are 2018 consensus estimates too low, but that 2019 also sees another step up. No one is going to pay $160 per share for a stock with earnings peaking at $8.00 in 2018. During the last major mining capex wave, CAT was the stock to own, as it outperformed the miners, which generally lost ground during the spending wave – Exhibit 8. Can We Get the Momentum in Metal – Is the Tin Roof Hot? The metals rally of 2010 – 2012 was driven by an acute Chinese shortage that caught all by surprise while most were still recovering from the financial crisis. The reality is the market had been very tight because of China prior to the financial crisis, which only caused a pause in Chinese consumption growth. China had kept building mining infrastructure and metals processing capacity right through the crisis, as had others, but supply only caught up with demand in the 2012/13 period and while investment continued, anticipating continued growth in China. It was only when the industrial economy in China slowed that the real scale of oversupply emerged. 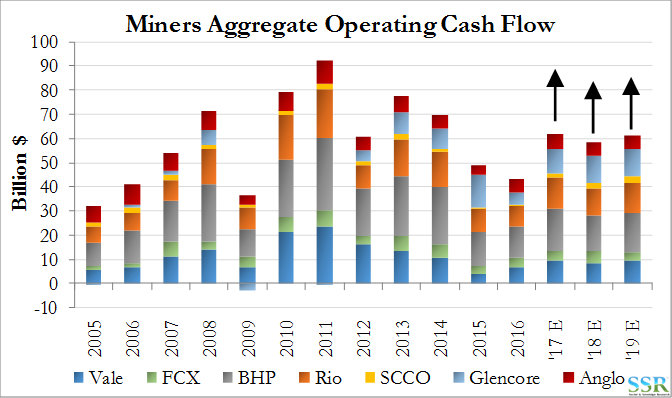 2015 and 2016 were the cash flow lows for the mining industry, as shown in Exhibit 9, limiting investment in new capacity to almost zero levels and forcing some closures and some M&A. If revised economic growth forecasts are correct, it is highly likely that the cash flow estimates for 2018 and 2019 in Exhibit 9 are too low. 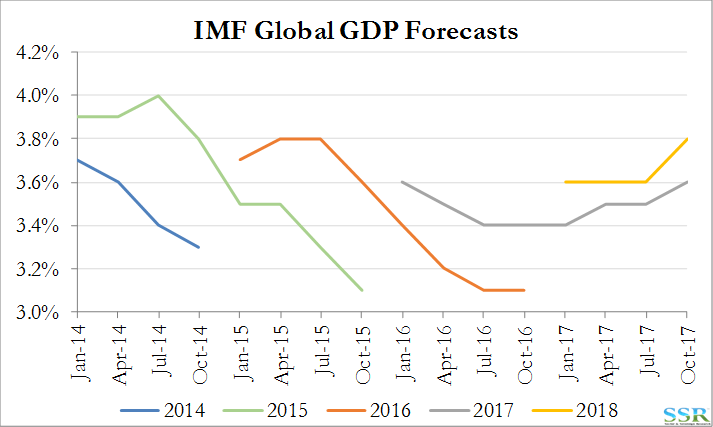 The improvements in the industry are in part due to some capacity closures in China, but they are also a result of slow and stable economic growth around the world for the last seven years (something we have discussed in prior research) and the more recent growth acceleration – best demonstrated in the recent IMF revisions – Exhibit 10. 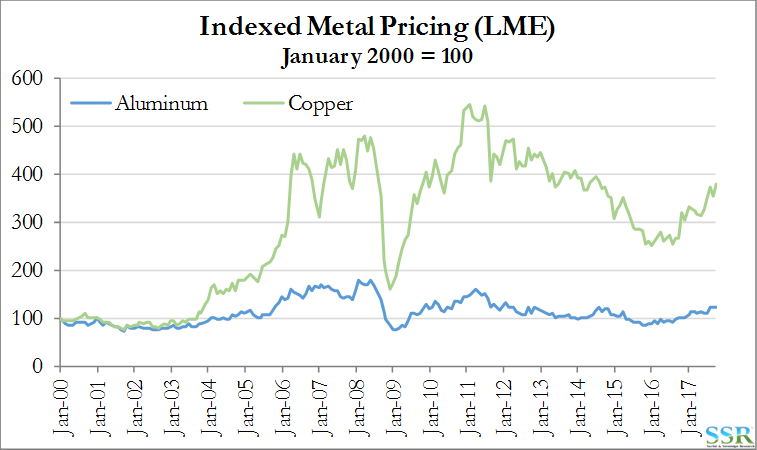 Metals pricing are rising – Exhibit 11 – and even iron ore is showing some signs of life. As we have written in recent research on AA, current estimates for metals and mining companies for 2018 discount a fall in metal pricing from current levels – yet the economic forecasts would support continued strength. The wide range of estimates and opinions on CAT likely represent a wide range of views on metals and mining, with the bulls also believing that the outlook for 2018 and 2019 for the metals space is too low. 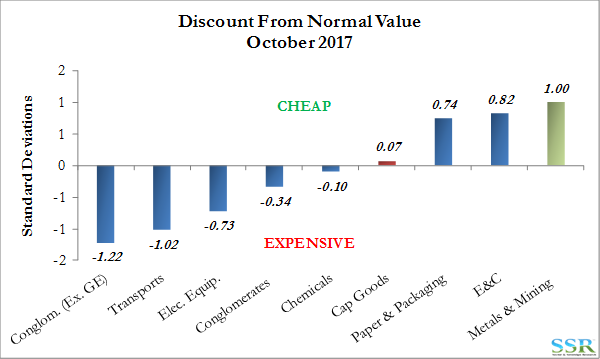 Broadly, metals and mining remains the cheapest space within our Industrials and Materials universe – Exhibit 12 – offering more upside in a recovery than one could ever hope to get owning CAT or any of the other mining exposed capital goods companies. In Exhibit 13, we show EV/2018E EBITDA comparing the major mining equipment companies and the major miners globally. 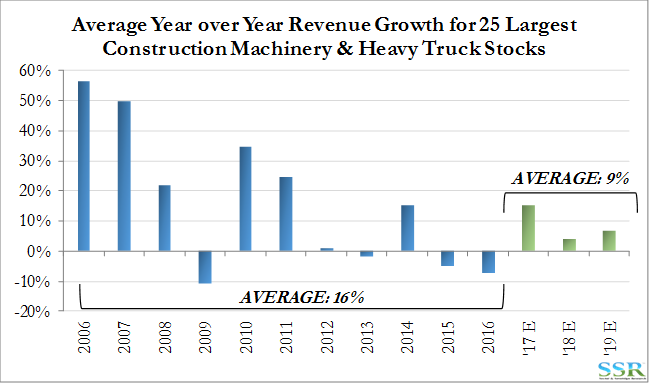 The equipment companies are already expensive – discounting improvements in the mining space, which remains cheap. 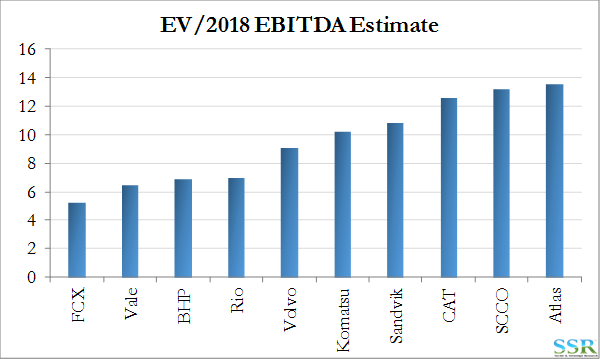 If CAT, Atlas, and Komatsu valuations are appropriate, EBITDA estimates for the miners for 2018/19 are too low and the valuation upside is significant.